A typical concert takes place at 19.30 in Salisbury Cathedral on a Saturday evening. The performance starts to become a reality on the Friday evening before the concert, when there is a rehearsal in Salisbury Cathedral. This is the first chance to get used to the acoustic of the building and to check that the staging and seating plan are correct. Usually only part of the work(s) will be rehearsed. If the concert is with the Chelsea Opera Group Orchestra, then the rehearsal will normally be with piano accompaniment only. 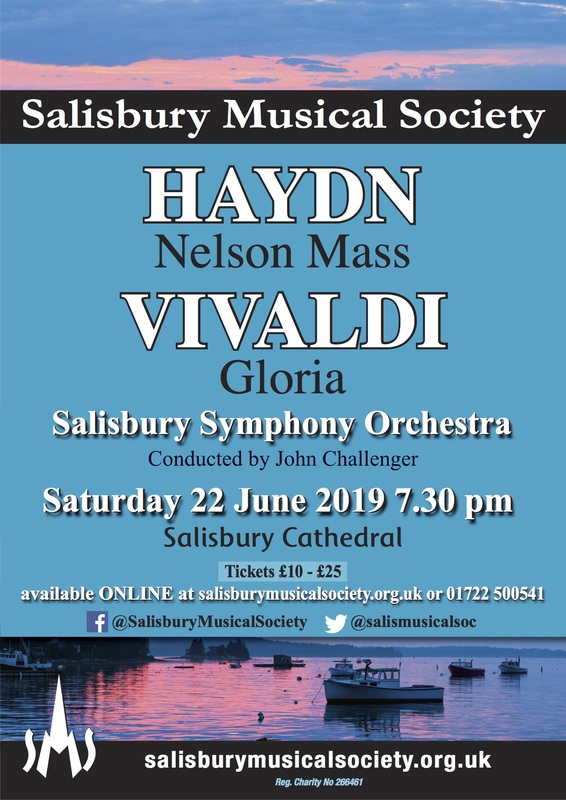 If the orchestra is the local Salisbury Symphony Orchestra, then most of them will attend the Friday evening rehearsal as well. The same is true of the soloists. If they are local then they will probably be present on Friday evening. On the Saturday afternoon there is a complete run-through for orchestra, soloists and choir. This usually starts at 13.45 and ends – for the choir, at least – at about 4pm, depending on the work and the conductor’s rehearsal schedule. The choir will be told how long it will take at the Friday evening rehearsal. Ladies: black jacket or cardigan, long black skirt or trousers, plain white blouse with shirt-style collar, black shoes; no jewellery. Gents: black dinner jacket and trousers, plain white shirt, black bow tie, black socks, black shoes. The choir assembles in the Trinity Chapel of the Cathedral at about 19.10 and then processes to the west end of the Cathedral, where it forms up on the tiered staging. The concert begins at 19.30 with a traditional opening welcome and prayer before soloists and conductor arrive at the podium. During the performance, even the stands and sits are choreographed. We normally have an interval during the performance, dictated by the number and length of the works involved. The choir doesn’t leave the stage during the interval. We always give free programmes to the audience and performers at our concerts. At the end of the concert a few members of the choir stand at the two exits with collecting baskets to seek contributions towards the costs of the concert. This retiring collection can provide as much as £600 towards our costs. If we sing with another choir at another venue, then we will follow their rehearsal pattern, but our concert dress will remain as above.